Winter this year is a lot more cold and rainy compared to the usual San Diego sunshine. I miss the summer weather and summer fruits like cherries and berries. 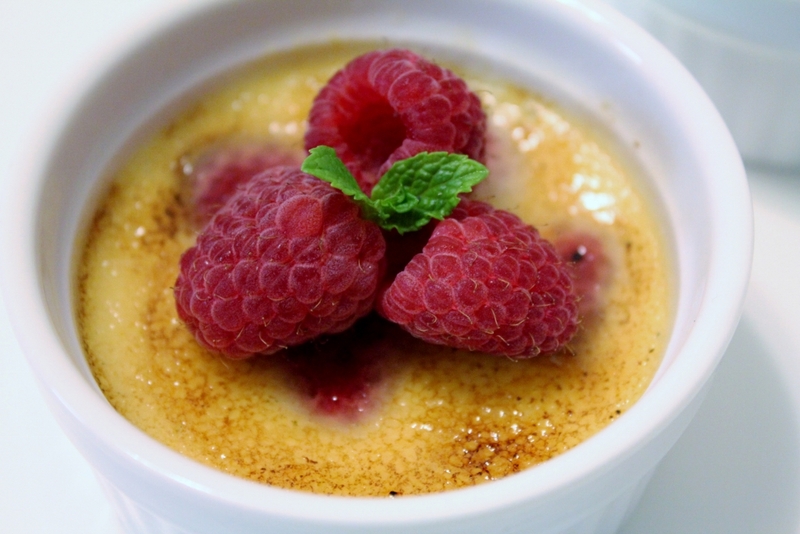 When I saw raspberries at Henry’s today, I grabbed them for my crème brulee. 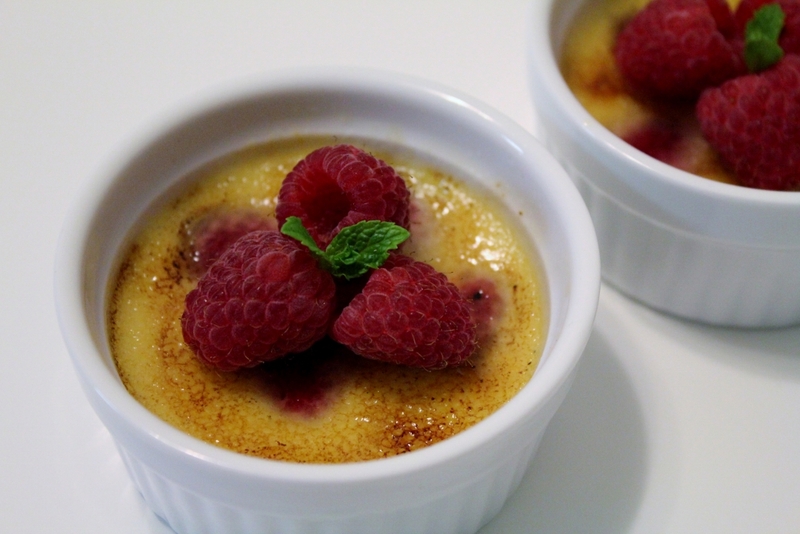 I got my inspiration from an episode of Barefoot Contessa making raspberry crème brulee as a holiday dessert instead of the classic crème brulee. Crème brulee is French for burnt crème, consisting of a rich custard base topped with caramelized sugar, but its origin is unknown. The Brits claimed that the dish was invented in Trinity College in Cambridge while the earliest reference of crème brulee came from the 1691 release of Massialot’s cookbook in France. I adapted this recipe from Ina Garten and it turned out wonderful, light, and creamy. This recipe makes 4 servings but you can scale the ingredients to accommodate your guests. The raspberries add a touch of red, making it a perfect dessert for your holiday dinner. Preheat oven to 325°F. 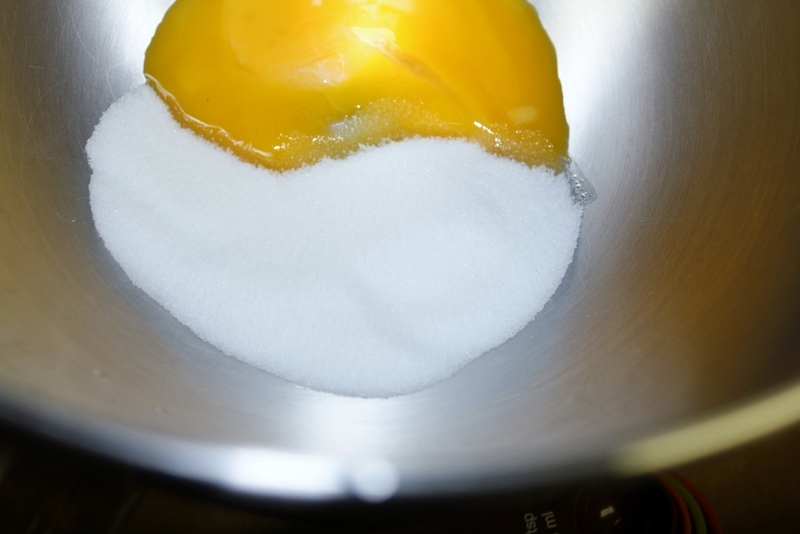 Whisk sugar and egg yolks together. In a saucepan, heat heavy cream and vanilla bean paste just to a boil. 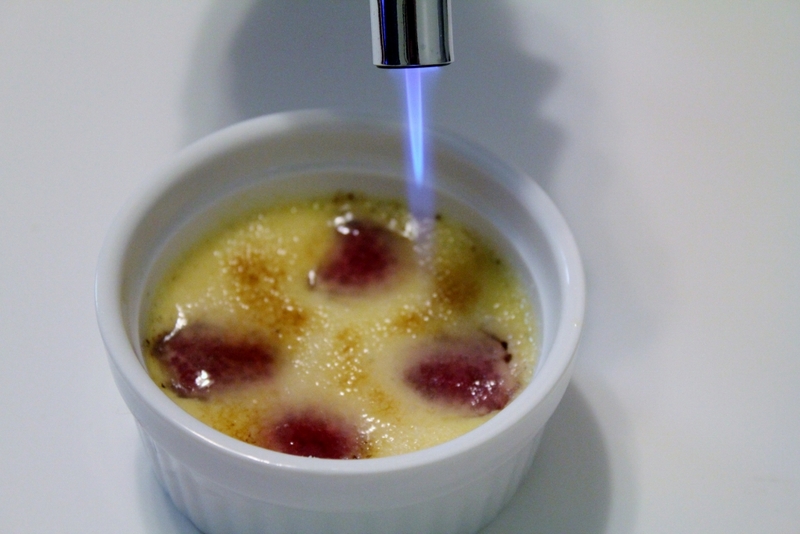 While cream heats, also begin heating a pot full of water for baking the crème brulee. 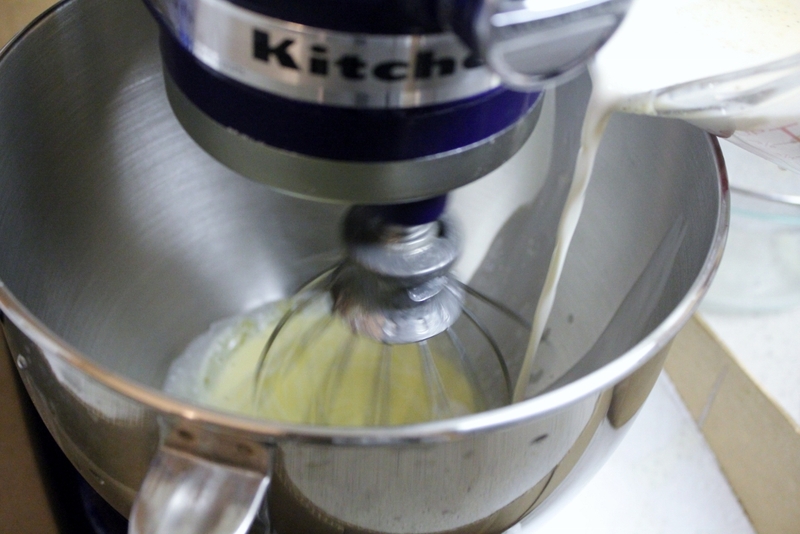 Gradually whisk hot cream into the egg mixture. 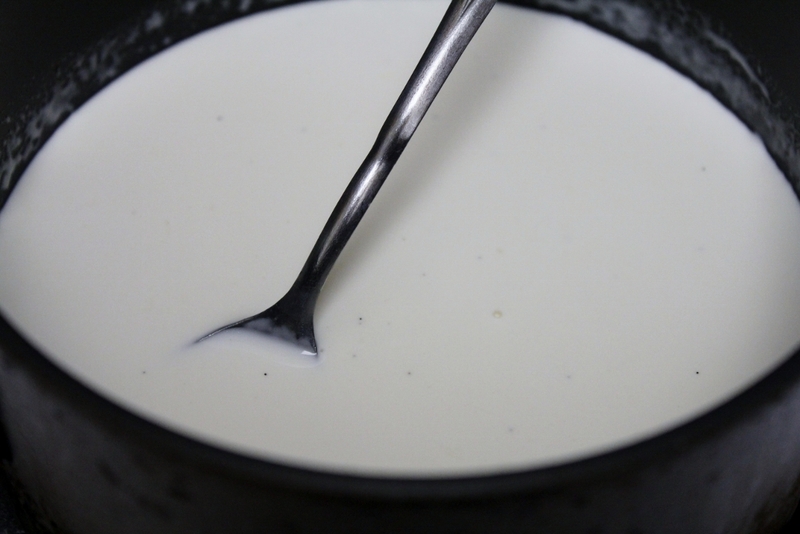 Strain the egg mixture to remove any lumps. 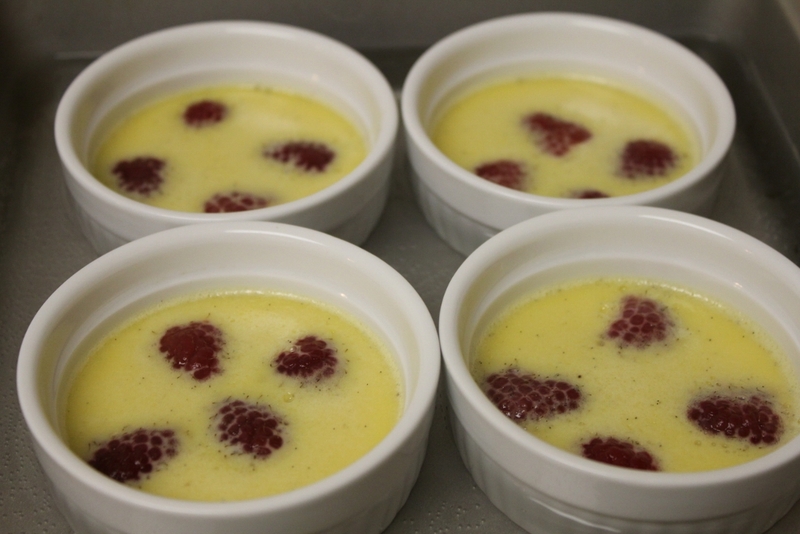 Place a few raspberries in the ramekins and divide mixture evenly between them. Pour enough water into the roasting pan to come half way up the sides of the ramekins. Carefully place the roasting pan in oven. Bake until the custards are just set, about 30 minutes. 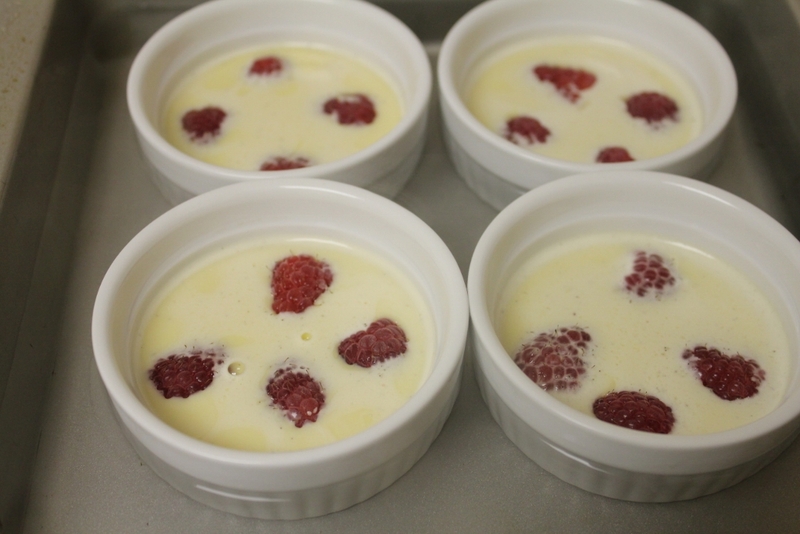 Remove the ramekins from oven and cool slightly at room temperature, then refrigerate for 4 hours or overnight. 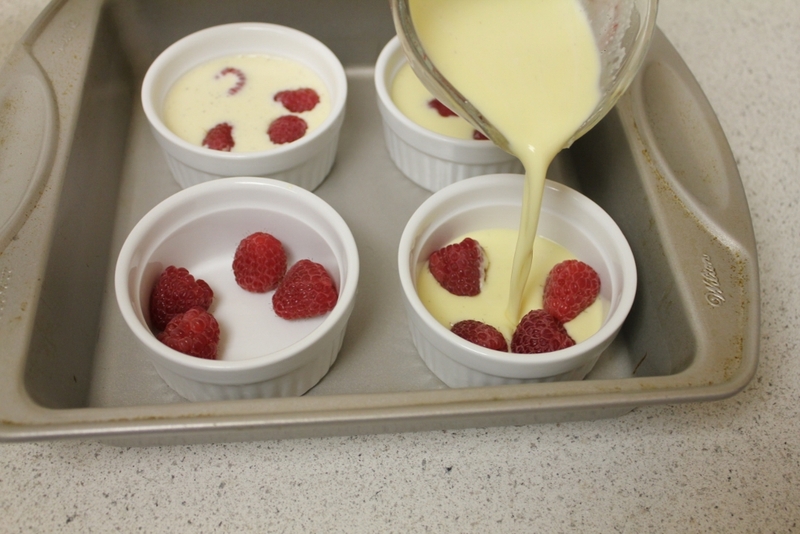 When ready to serve, sprinkle 1/2 tbsp of sugar evenly on the top of each ramekin and using a propane torch, hold it so the flame just touches the surface. Start at the center and spiral out toward the edges of the ramekins heat until the sugar caramelizes evenly. 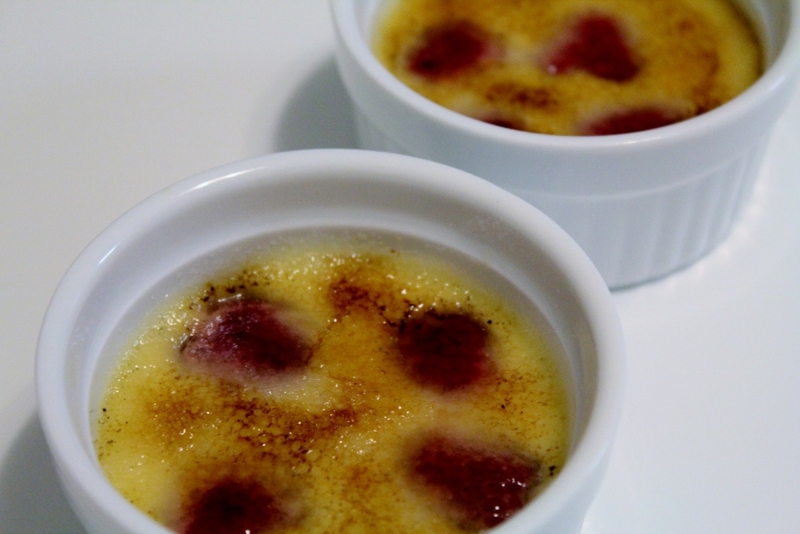 Let the crème brulee cool for a few minutes before serving. Garnish with fresh raspberries and mint. Enjoy!